I remember when I got my own library card. It was like being handed a bank card with no limit on it. Sometimes I still can't get over how awesome libraries are. They let you take a bunch of books home! For weeks at a time. For free!! And mine is a fairly large system, so they have an excellent collection of ebooks, which is how I do most of my reading these days. If your local library doesn't have a big ebook selection, check to see if there are others in your state that do that you can join. I live in Pittsburgh, but any Pennsylvania resident can be a member of the Big Free Library of Philadelphia, and they also have a great ebook selection. There's really nothing like checking out your library book and starting to read without ever having to get off your couch! A library convert!! 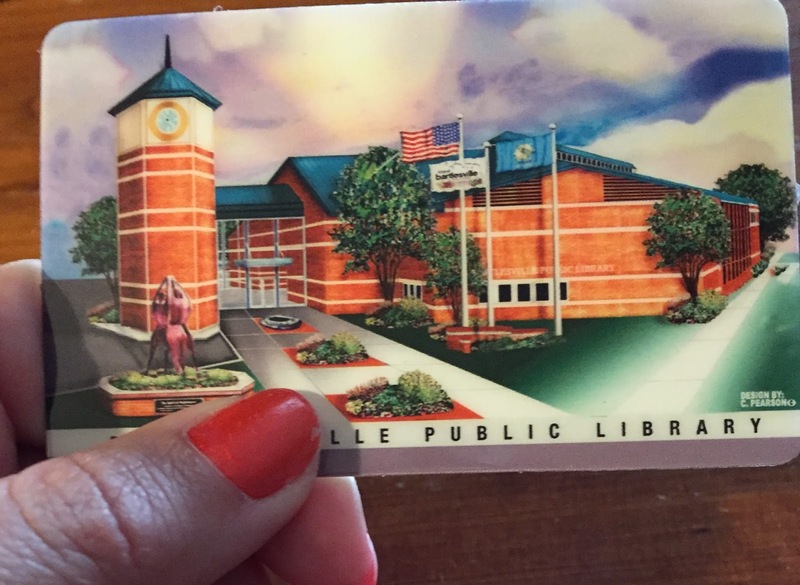 I work at a library so this makes me weirdly happy, but your card looks way cooler than ours. Also good luck on the law school thing, I just graduated from it last year. I love the library and the ability to get lost inside the maze of bookshelves! Not that I'm biased in any way though, libraries are just the only way for me to constantly get books considering I'm also broke lol. P.S. I wish my library card was a fancy as yours. What a sweet story! I need a little town like that. My perfect town has outgrown its romantic call to me that had me move here in 2002. Such a great story! I love you guys site! Man I have to say that your cards are very pretty vs. what they give us here in Winter Haven, FL. Ours look like crap lol. I think I have enough books on my TBR list that I won't need to hit the library for a while. Glad to hear that your reading again. And ya I think most of us feel ya on the broke thing. YAY LIBRARIES! Pennsylvania is awesome in that the entire state is linked - as long as I have a card for the county I live in I'm able to get a card anywhere. Right now I only have two, but I've been thinking about getting a third for when I'm back in my hometown for a visit! (You can never have enough books!) ALSO, if you haven't already, check out Overdrive - it's the online database for libraries. I've mainly been using it for audiobooks, but I've snagged a few ebooks as well and they even have movies and magazines. And I'm SO curious - what was the book the lady was reading at the pool?? I couldn't live without my library card! I could never afford to buy all the books I read and of course I also hate getting burned on a book that sounds good but turns out to be "meh". Luckily for me, my library lets you keep most books for four weeks, plus you can renew online! New books are two weeks though, but you can still renew if there's no active hold on the book. Libraries are so much fun, I'm glad you got a card! I used to collect library cards haha. We had a couple different library systems near my growing up and I had a card (and fines, whoops) at each one. The library near where I live now is so great, I'm trying to use it more. It feels like shopping for books without the money or commitment! And it's nice because if there's a book I want to read, I can suggest it to the library and they might purchase it. I loved my library cards when I was a child. We had 12 cards as a family and yep - between me and my sister we rotated those cards every 2 weeks. Good times! Enjoy your card. Welcome to the "dark side". I am a huge library fan where all resources are free. Yay for libraries! There's something about just stepping into a library that feels wonderful. When I studied abroad in London for six months, one of the first things I did was take my student ID and get a library card at the nearest library-it instantly made me feel at home. I used to work at a library and it was always a joy to see people get a new library card. I loved seeing kids getting their very first library card it was so exciting! As long as I can remember (12 years) the library has had online renewal or at least an answer line you called to renew materials. Maybe it's different in your area. Anyway congratulations on your new library card!